The Orange Municipal Airport provides the North Quabbin Region with a unique mixture of grassland, farmland, shrub and young forest habitats adjacent to mature forests and wetlands. This land use mosaic provides habitats for a wide diversity of plant and animal species. 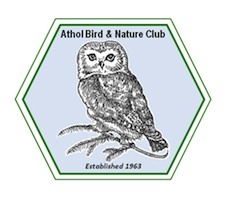 A dense fog covered the Airport, as members the Athol Bird and Nature Club assembled at the administration parking lot where Club President Dave Small met the group for a morning of exploration. The Sun quickly began burning through the haze as Morning Doves, House Sparrows, American Crow, Blue Jay, and Northern Flicker were noted. With special permission from Airport manager Lenny Bedaw the group traveled the perimeter access road. Traveling clockwise around the facility the group observed a Morning Dove flying for its life with an Adult Coopers Hawk in close pursuit. Upon seeing our group the hawk disengaged the pursuit and calmly headed back to the forest edge. The Coopers hawk population has been increasing over the past decade in part due to the maturing of the area woodlands as they transition from abandoned farm fields to the Coopers preferred forested habitat. The airport is widely used by hawks and falcons throughout the year but are present in especially high numbers during migration. Near the South end of the Airport a large area is under cultivation by Hunt’s farm to raise corn. The recently harvested fields have been planted to Winter Rye, a fast growing plant used to stabilize and enrich the topsoil over the winter. Piles of cow manure ready for spreading on the area provide a source of food for many birds. With the help of spotting scopes a flock of 18 American Pipits were studied clearly observing the streaked breasts, and white outer tail feathers of these migrants visitors from the Canadian Tundra. With the autumn sun in full glory, several American Kestrels could be observed perching on the runway lights or on the tarmac. Other Kestrels hovered, showing their bright rusty tails and blue backs as they searched the ground for their favorite meal of grasshoppers and crickets. A Merlin perched on the top of a large White Pine at the forest edge took flight and swift powerful wing beats propelled the medium sized falcon across the airport and out of sight. Nearing Canning Drive the largest of our resident Accipiters, a Northern Goshawk, flew out of the forest edge over the Airport only to be pursued by a Crow who repeatedly harassed the Goshawk until both were out of sight. Not seen on this fall morning day were two sparrows listed by the Massachusetts Natural Heritage and Endangered Species Program which breed annually in the airport’s interior Little Blue Stem grassland. Grasshopper and Vesper Sparrows are adapted to this specific habitat type which is disappearing in the east due to farm abandonment and the control of wildfires which help perpetuate these warm season grasses. As the human population of Massachusetts continues to grow scientists predict populations of obligate Grass and shrubland bird species will continue to decline. Managing for these specific habitats may only be practical in conjunction with large areas already under management for other uses. Airports, power line right of ways and commercial farms may be the only refuge for these unusual animals. A final stop at the proposed South Park industrial site adjacent to the airport and Route 2 completed the morning trip. An area overgrown with weeds was filled with many birds including Savannah, Song, White-throated and Swamp Sparrows. Palm Warblers, Gray Catbird, Eastern Towhee, Phoebe, Rose-breasted Grosbeak, Goldfinch, Ruby-crowned Kinglet, Hairy Woodpecker, and Red-tailed Hawk rounded off the day’s list.